This thread cracks me up every time it gets bumped. Poor Sal can't fart in public without it getting quoted lol. This talk about an LC200N Swick means I will finally buy one. It really is better than it has any business being. I'll be buying one of each hole size to see which I like best and then I will buy two or three of it. I just want to know if it's going to be a wharnie. "I just got a sample of the Waterway. 'Tis a beautiful piece. I'm waiting on a sheath to test and I'll bring it to Hawaii with me. Curious what the lock might be! CBBL could be likely for FRN? Yuck might turn out to be appropriate but I doubt it. I like my FRN Spydies just as much as all the others. I'll be interested to see what they're going to do with this one. "Probably not till the first of the year. 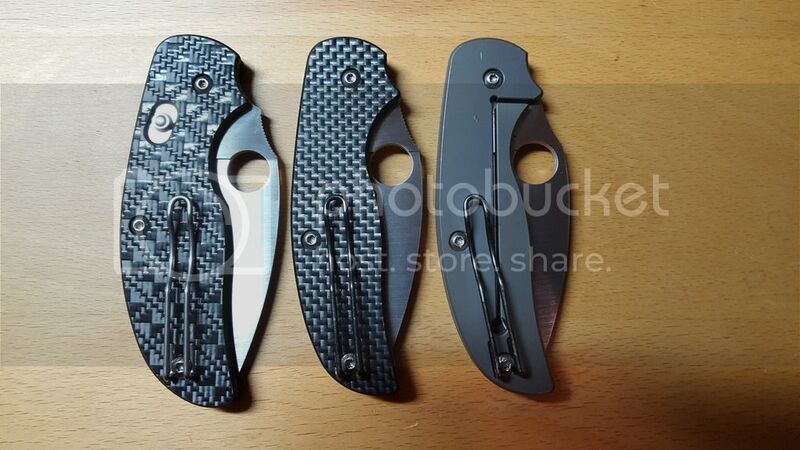 I am not dissing on FRN, i just wish they/Spyderco would keep the Sage family a bit "classier" for lack of better words. After Cf, Ti and ironwood FRN does feel a little "Really??" CBBL Sage sounds good too. Put them together, and a CBBL FRN Sage sounds great! I'm not sure how they'd avoid it, but I really hope a CBBL Sage doesn't have the extra "hump" like the Sage3. I'm unfamiliar with this hump you speak of. I looked at some photos, but haven't discerned an appreciably-sized humps. I also have never held a Sage, so I have no feel memory to reference. Let's see if I can quote a post a from another thread. If this works, notice how when closed the Sage 3's blade sits higher above the handle than the Sage 2's blade does. Excellent! I only looked at open pictures, so with the closed picture I now see how less of the Sage 3 blade rests inside the handle when closed than the others. Thanks, ugaarguy! Abbazaba, is that what you meant? You're welcome, and thanks to Sharp Guy for doing the real work of taking and uploading the comparison pic.